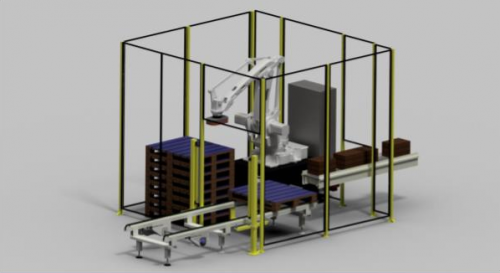 CKF Systems, the leading supplier of automated handling, robotic solutions and conveyor systems to manufacturing industry, has developed a range of cost effective robot handling cells designed specifically for those businesses currently operating a manual palletising line. The AC25, a direct replacement for existing manual operations, is exceptionally easy to install and operate and at a cost of just £80,000, will typically provide a payback in under two years. A typical manual palletising line is, by its very nature, a labour intensive handling operation with inherent limitations in respect of box sizes, weight and restricted flow rates. The AC25 will operate at 15 cases per minute and, unlike a human operative, is not compromised by the introduction of layer cards or heavy boxes. Furthermore, current legislation restricts the maximum unit weight that an operative can lift and also defines the maximum achievable stack height on a pallet. The AC25 Robot Palletising Cell has none of these limitations, its versatility includes increased stack heights that provide better trailer utilisation, reducing transportation costs and therefore providing a subsequent environmental benefit. Manufactured in the UK, the cell utilises an ABB 4-axis robot and industry standard equipment and comes with full support, including training and spares, a 12 month warranty and the option for a range of add-on features. It is capable of handling cases with dimensions of up 400mm long x 300mm wide x 250mm high and a net weight of 25kg. It is designed with enhanced handling capabilities and high reliability levels. The CKF Palletising Cell will handle Euro or UK pallets with layer cards as an option. In addition, the cell can easily be expanded to accommodate a series of additional modules such as vision cameras, layer cards, open-flap detection and pre-collation of boxes for increased throughputs and alternating pallet patterns.